Can overpower, recommend 5-10% range for wearable fragrances. Peppermint Essential Oil has strong minty notes with herbaceous warm undertones. The Peppermint plant is a summer-growing perennial with upright square stems reaching three feet in height at maturity. Peppermint Supreme Essential Oil is widely credited with being a digestive aid. 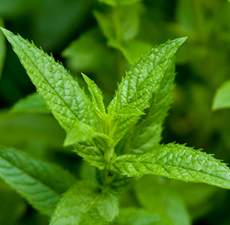 Peppermint leaves contain menthol, which is a proven aid to digestion. The familiar aroma of Mentha piperita is known for both its warming and cooling properties. Friendly to the sinuses, peppermint is also useful to the muscular system, especially for women during monthly cycles or menopause. Properties include being refreshing, a mental stimulant and energizing. It relieves bad breath and is a good nerve tonic that helps with mental fatigue and nervous stress. Peppermint Supreme Essential Oil should be used well diluted since high concentration can cause a burning sensation and sensitization. Avoid use during pregnancy.